This article first appeared in City & Country, The Edge Malaysia Weekly, on June 11, 2018 - June 17, 2018. Student life is said to be one of the best times of one’s life. However, poor and inadequate accommodation can prove stressful. As a student, I recall visiting a friend’s rented unit and thinking how living there must be a nighmare as it was very badly maintained. Thankfully, there are many choices of proper student housing today and parents are willing to pay for comfortable abodes for their children. Indeed, student accommodation has become a possible asset class for investors if they know what they are doing. And with the increase in the country’s higher-education student population, the demand for space to house them is growing fast. In fact, Malaysia plans to double its international student enrolment from more than 135,000 in 2014 to 250,000 by 2025. “Out of a total of 661 higher education institutions (HEIs) in the country, the private ones account for the bulk of them, at 513,” says CBRE|WTW managing director Foo Gee Jen. “At end-2016, there were about 132,000 international student enrolments, up 9% from 2015. “Our informal enquiry with private HEIs revealed that the enrolment of international students is growing with the majority of them coming from other Asian countries, notably China, Indonesia, Africa and the Middle East. The government aims to attract up to 200,000 students by 2020. For Adzman Shah Mohd Ariffin, the CEO and chief real estate consultant of ExaStrata Solutions Sdn Bhd., he sees a growth market for student housing. “The market for student accommodation has been active in Malaysia in the last few years. Most are concentrated close to colleges and universities. Localities such as Shah Alam, Subang Jaya, Cyberjaya, Sunway, Setapak and Cheras and places like Semenyih and Kampar outside the Klang Valley have seen a lot of student accommodation being built. “Given that Malaysia is striving to become a regional hub for tertiary education, student accommodation is expected to be in demand. Properties on the secondary market in areas close to colleges and universities are increasingly being converted into student accommodation. Even shophouses have morphed into student hostels. “There is an indication of a shortage of campus accommodation that has led to a spillover into private housing. Also, there are not enough rooms available as it is for students. Hence, it is definitely a viable investment product,” says Adzman. Foo adds, “It is estimated that effective monthly rent can range from RM2 to RM3.50 psf with three to five students housed in one condo. This is highly viable when there is a captive market of a large number of students, and this will remain a stable source of demand over several years. “In Kampar, Nilai and Bangi, there is a strong demand for student accommodation due to the large number of education institutions and corresponding students in the area. High residential occupancies are observed with higher than average rental rates,’ he adds. Both property consultants estimate the returns from student accommodation to be between 5% and 6%. Uncle J Rooms’ former owner, James Wong — he sold his business to enterprising young businessmen Dino Loh, Yong Keith Cheah and Sam Chor in 2015 — was in the student accommodation business for more than 18 years. In 1999, he started renting out his unit at Ridzuan Condominium in Bandar Sunway to students and later helped others do the same. He eventually came up with a system to ensure the returns were maximised. Wong recalls the early days when he would rent out the entire apartment or house to a group of students, only for them to go their separate ways over arguments over the payment of the shared rent and utility bills. So he decided to only rent out the rooms, which made life much easier for him. Having handed over the reins to the three entrepreneurs, he looks back on his journey and thinks more can be done to help the sector. “These last 10 years have seen lots of aggressive hype on student housing with many subsale properties — 2-storey houses, apartments and shophouses — bought and converted into student hostels. “Many developers have also cashed in on the trend by building so-called ‘customised student accommodation’ near colleges and universities and even giving guaranteed rental returns. “Frankly, I am worried as these buyers are purely investors and do not have the passion to make sure that their student housing has adequate security and safety features … I would like to see more regulations to protect these students who are our future captains of industries,” Wong says. Chor and his partners saw an opportunity to grow the business as more students, both local and foreign, are now looking to study in Malaysia. “With the current state of the economy as well as the weakened currency, many Malaysians are opting to have their children further their studies in local universities. As for the foreign students, with the weakened ringgit and the fact that Malaysia has some of the top universities in the world, this country has become a very affordable option for higher education,” he says. “But this has put a strain on available student accommodation. As we get deeper into the business, we realise that there is a significant gap in terms of what parents are looking for versus what is being offered in the market. Uncle J Rooms takes a management fee of 10% to 20% from the collected rent, which includes weekly cleaning services, rental collection, utilities settlement and other services. 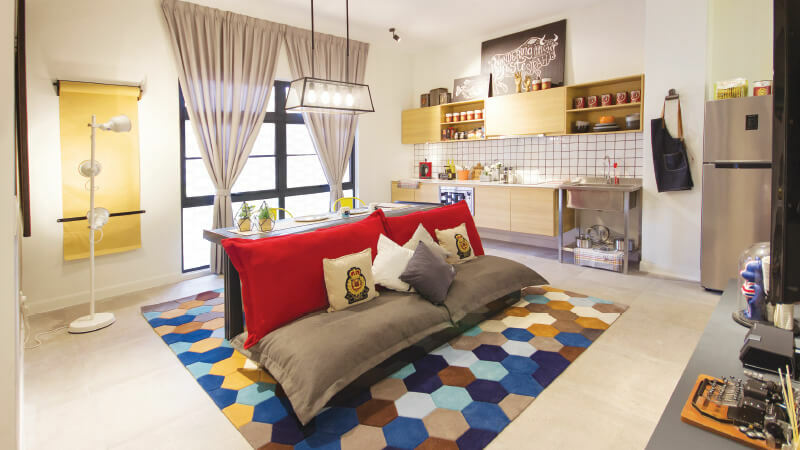 Incidentally, the company was engaged by developer Symphony Life Bhd to help in the design and layout of the units in its Union Suites project in Bandar Sunway, so that the apartments, amenities and facilities would appeal to student tenants. While students get a comfortable and safe place to live, the company’s owners get returns that look promising. Wong, meanwhile, explains that to maximise the amount of rent, the units should be renovated with the addition of a room or two where possible. He stresses, however, that such renovations should be done with the permission of the authorities and adhere to the regulations. Chor agrees, giving an estimate of returns from two renovated properties with added rooms — a 1,000 sq ft condo with four bedrooms in Bandar Sunway and a 2-storey terraced house with eight bedrooms in SS15, Subang Jaya. For the condo, the average room rent is RM980 per month while the total gross rent collected is RM3,920. After paying the service, internet and maintenance fees, the homeowner can make up to about RM2,800. As for the terraced house, the average room rent is RM600 per month while the total gross rent is RM4,800 a month. This means the return is around RM3,900. While this may appear lucrative to some, managing the units can be a challenge. Says Steadfast director Mike Tiu, “Our biggest challenge is to handle student complaints and conflicts, especially when something is not working. The students expect it to be rectified immediately and sometimes, the owners do not want to fix it because of the cost. To solve the issue, we employ a ticketing system, which has a given time frame to fix issues or solve problems for them. Steadfast’s management fee, which includes the charge for the upkeep of its units’ common areas, is between 10% and 12% of gross rent. Other aspects that need to be looked into is the interior design of the units. “We provide affordable renovation services to increase the capacity of a typical 1,000 sq ft unit and tastefully furnish it into move-in condition. This not only increases the likelihood of securing a tenant but also raises the perceived value of the property,” explains Tiu. To Wong, Chor and Tiu, the secret to success is the personal touch and value-added services that tenants are willing to pay for. However, a news report in March has cast a shadow on the student accommodation business. The report said students living in residential areas were noisy and took up parking spaces, and highlighted the lack of safety of such accommodation. But according to Uncle J Rooms and Steadfast, strict house rules and conditions are imposed on the students to ensure the peace of the community. Also, most students do not own vehicles, so parking is not an issue. And in terms of safety, strict house rules are enforced to ensure the security of all tenants. In fact, Uncle J Rooms conducts an annual fire drill in which students learn how to put out a fire using fire extinguishers. According to Wong, in 2011, the Subang Jaya authorities stipulated that student hostels needed to comply with the regulations set by the municipal council. The student hostel operators also needed to apply for licences to operate legally. In the final analysis, though the student accommodation sector promises attractive returns, the business cannot be done haphazardly and various factors have to be taken into consideration. Still, as the local and international student population keeps growing, this may be one investment sector worth looking at.